The CPE Gateway Solution (CGS) from TeamF1 is a comprehensive turnkey software package enabling the next-generation of rich, auto-provisioned residential gateways and CPE routers deployed by broadband Service Providers (SPs). TeamF1’s CGS solution provides OEMs and service providers with flexible connectivity options and security technologies from TFOS platform’s field-proven and validated modules. Along with network storage and media sharing abilities, OEMs can select modules for building routers with leading-edge networking and security options of their choice. In addition to a standard Ethernet interface on the wired side, TFOS line of products support a variety of other back-haul options such as broadband and serial interfaces, and cellular data (3G/LTE) links. It enables OEMs/ODMs/SPs to deliver advanced home area networking devices for a seamless and secure “connected-home” experience to end-customers. 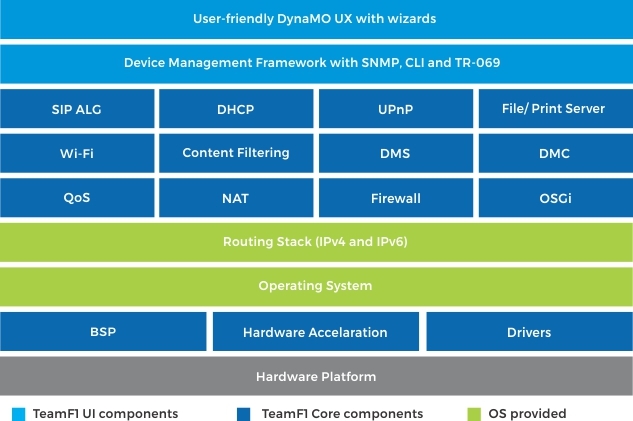 TeamF1 offers a unique and scalable solution that easily manages and helps in troubleshooting the home gateway router. Based on the TR069 protocol, published by Broadband Forum, the CPE Gateway offers an integrated solution to remotely manage and control the home network devices, like routers, i-phones, smart phones, laptops, IPTV STBs, and VoIP phones. The automatic configuration and management is done through ACS (Auto Configuration Services) which handles the communication between the devices. The TR-069 device management feature helps the service providers to gather complete information regarding all the home network devices. Advanced Connectivity features like routing, bridging or hybrid network configuration. With robust product portfolio and superior services in India. D-Link (India) Limited is working jointly with TeamF1 Networks to bring the latest turnkey innovative solutions to the market. © TeamF1 Networks (P) Ltd. All Rights Reserved.